As a frequent visitor to London, I'm always drawn to places that are somewhat off the beaten tourist track. Since London has long been a destination for many people from all walks of life, inevitably there have been some gruesome and shocking crimes that have taken place there. In the fascinating book Murder Houses of London, author Jan Bondeson takes a look at the places that have been the scenes of murders most foul in the capital city over the past 200 or so years. Interestingly, in this book, he concentrates of places that the, ahem, student of crime can still visit. He's put in a great deal of detective work to find the locations of crimes where streets have been renamed, houses renumbered, and various building projects have rendered the locations all but unrecognizable. Still, if you want to see where John George Haigh dissolved his victims in acid, or where George Joseph Smith dispatched some of his "brides in the bath," this is an indispensable guide! The book is divided into sections based on areas of London: Westminster, Kensington, Islington, Chelsea and Fulham, etc. and then arranged chronologically. Many famous cases are covered, as well as ones that I'd never heard of before. While many of the crimes were "solved" (well, someone was arrested, tried and frequently hanged), there are also many cases that remain unsolved to this day. I was especially intrigued to learn that the street where I stay on my visits to London, Cartwright Gardens, was the site of two unsolved murders in the 1800s. The houses are long since gone, so one can hope that the ghosts of the victims have also departed the area! The book contained a great deal of historical information and many cases that are probably not well-known among the general public. There are many illustrations scattered throughout the book, both black and white pages (mostly from the Illustrated Police News), black and white contemporary photographs, and color pages of what the notorious houses look like today (which I'm sure the current owners greatly appreciate!). The only slight quibble I have with the book is the tendency for some repetitive language. The phrase "things weren't looking too good for" defendants in murder trials is used multiple times, as is the habit of calling suspects a "cove." Still, if you are discussing murders, suspects and trials, I guess there are only so many ways to say the same thing over and over! 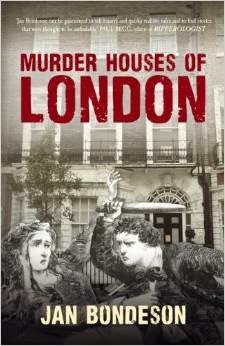 I think anyone with an interest in London history or true crime would enjoy this book. 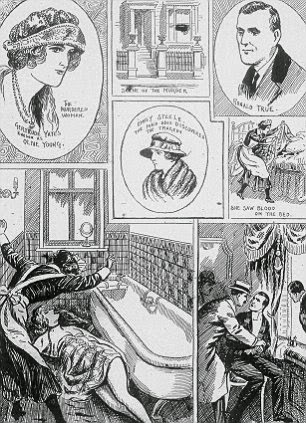 I especially enjoyed the many illustrations from the sadly defunct Illustrated Police News, particularly the startled expressions and wild gestures of those who found the murder victims. If you've already visited London and been on one of the many Jack the Ripper or ghosts tours, this book provides ample information for you to design your own "murder house tour" on your next visit!